They call themselves advocates for the disabled but serial ADA lawsuit filers have now inspired a Florida lawmaker to take action. Florida Representative Tom Leek (R- Ormond Beach) recently filed a bill (HB 727) that gives businesses the opportunity to fight ADA lawsuits once they're served with papers. During a press conference in the State Capitol Friday morning Leek touted the bill as a way to stop what, he says, has become a cottage industry for lawsuit abuse. "The purpose of the ADA has been perverted by a small handful of law firms that have filed hundreds upon hundreds of these lawsuits against small businesses for monetary gain," he said. Leek introduced the bill as a way to give businesses the chance to fight back. Here's how it would work. Businesses, before ever being sued, could voluntarily hire a certified state expert to identify violations of the Americans with Disability Act (ADA). That expert would then put together a remediation plan with a reasonable timeframe of when violations should be corrected. So, if the business is sued for an ADA violation, that business could file the plan with courts showing they're working to fix the ADA issues. Leek hopes the plan would stop businesses from often having to pay exorbitant attorneys fees to fight these cases. A few years ago Michael Marsh, owner of Shoreline Island Resort in Madeira Beach, was sued by Florida's most prolific ADA filer, Howard Cohan. The suit alleged the resort was not in compliance with the ADA because of a series of ADA violations including parking space issues and the lack of a pool lift. Marsh, who bought back the resort his family once owned, didn't realize he was in violation of the ADA when he was served with the lawsuit. "I want to see where we are informed of the things we're out of compliance with. I think this bill is trying to do that, it's a step in the right direction," he said in response to the filing of the bill. However, Marsh cautions that the bill doesn't appear to do enough to make sure business owners like him know in advanced that an expert is available to provide those kinds of services. Leek's bill aims to help provide a guide for businesses and a resource to become ADA compliant. 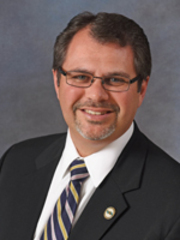 But Palm Beach Gardens based attorney Gregory Sconzo, who represents Cohan, says this bill falls short. "The bill, in theory is great for businesses and great for the disabled but in reality this bill is great for businesses and terrible for the disabled," he said. "There are properties out there that still don't have handicap parking, to that there's no excuse," he said. Sconzo who has represented both businesses and individuals in ADA cases fears this bill would prevent people with disabilities from being able to file lawsuits against businesses not in compliance. If a business pays for a self-evaluation, that plan would be good for 10 years. Though the certified expert would determine within what time frame violations should be fixed. "There are properties who will use this as a shield and give them another 10 years to comply with the ADA. In another 10 years they still won't be able to comply with the ADA and that's not what anyone wants," Sconzo. said. "My response to those who think this encourages businesses not to come into compliance, read the bill you're wrong. This bill is precisely designed to encourage businesses to come into compliance and provide greater accessibility," said Leek. 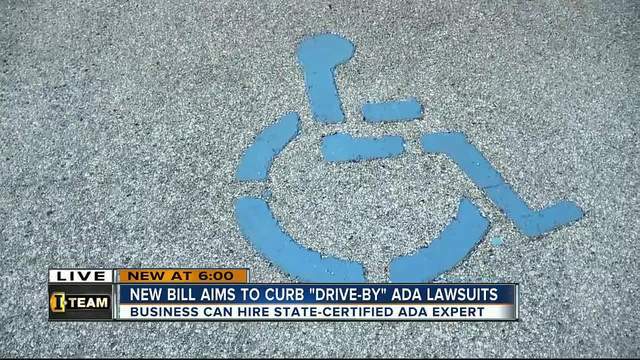 Florida is among the top states for ADA lawsuits and serial filers. Between January 1, 2012 and November 16, 2016 5839 ADA lawsuits were filed in Florida.